After the shocking events of SLATED and FRACTURED, we return to Kyla’s oppressive world as she tries to make sense of her lfe and everything around her. 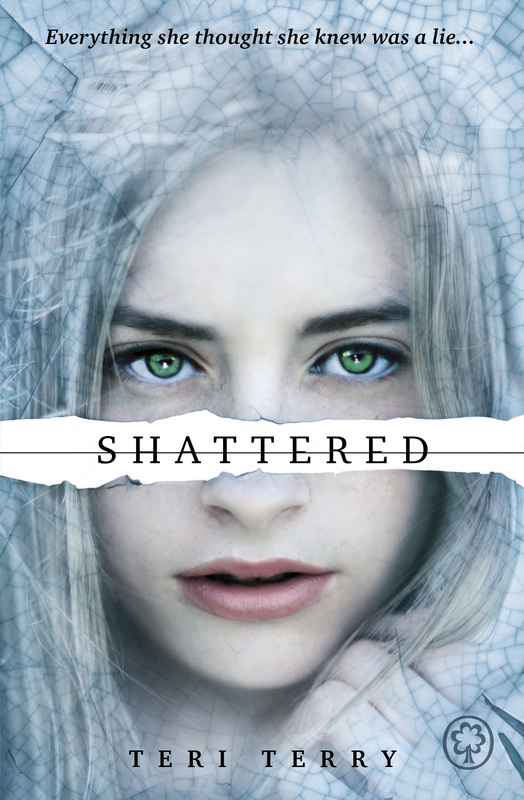 I’m very pleased to reveal the cover for the final book in Teri Terry’s Slated trilogy, Shattered. I loved the first two books in the trilogy and I’m really looking forward to finding out how it all ends. You can read my review of Slated here on the blog. Shattered is due for release in the UK in March 2014, so we should get it in NZ around the same time. First there was Genesis, then Equinox, and now there is the dramatic conclusion to The Rosie Black Chronicles, Dark Star. Lara Morgan grabbed me right from the start of Genesis and I’ve been dying to find out how Rosie’s story will end. Will she be able to bring down Helios and save her world? To protect Pip and fulfil her deal with Sulawayo, Rosie Black has joined Helios. But trouble is brewing within the ranks of the powerful organisation a rebellion is rising. Who is part of the rebellion? Who is trying to take full control of Helios? How does the mysterious Dark Star fit into these plans? The stakes are high for Rosie. The survival of Pip and the world as she knows it depends on her. Can Rosie find the truth and save those she loves before it is too late? Dark Star is an action-packed, tense, sci-fi thriller and the perfect end to this fantastic trilogy. Our favourite characters return to help Rosie bring down Helios, and Lara also introduces us to some new characters who have their part to play. There are plenty of twists and turns in the story as, like Rosie, you’re never sure who to trust (is that person part of the rebellion or is it all an act?). From the moment you enter the Enclave with Rosie you’re on edge, and as Rosie discovers more information about Helios and her situation gets more desperate you start to turn the pages faster. One of the things I like the most about the series is that the romance between the characters doesn’t get in the way of the story. There has always been a thing between Pip and Rosie, and in Equinox (the last book) a relationship developed between Dalton and Rosie, but their relationships don’t take over the story (like many YA series). In the world that they live in there isn’t really time to stop and stare longingly into each others’ eyes, but their relationships still affect their decisions. The bonds between them mean that they are willing to sacrifice their own safety (and their life) to help each other escape. You just hope that they will all make it through and be able to have their romantic moments after they’ve saved the world. I also love the technology that Lara has created in her future world. There are medical patches that heal wounds, AI taxi cabs, pulse guns, a portal to transport people onto other planets, and many other fantastic inventions. A lot of her technology is more advanced versions of what we have today so it’s not hard to imagine a world like Rosie’s. Lara ended the story perfectly, tying up the loose ends, but also leaving it open so that you can wonder about what might happen next. If you haven’t read The Rosie Black Chronicles get them from your library or bookshop now. Thanks to Walker Books Australia I have a set of The Rosie Black Chronicles, signed by Lara Morgan, to give away. You can enter here. I think I’m probably James Dashner’s number one fan (outside of the US). His Maze Runner Trilogy is one of my favourite series and the first book, The Maze Runner, is in my top 5 books. It’s one of those books that keeps you constantly on edge, trying to figure out what the heck is going on, and James Dashner’s amazing storytelling sends a shiver down your spine. Although the first book is my favourite of the series, James keeps you in suspense and reveals little pieces of the puzzle throughout the rest of the trilogy (The Scorch Trials and The Death Cure), making you eagerly await the next installment. The Death Cure was the perfect ending to the series, but James felt there was still more of the story he wanted to tell, specifically how the world went to hell in a hand basket and why there needed to be a maze in the first place. The prequel to the Maze Runner Trilogy, The Kill Order, has just been released in the US and I had to know how it all started. I felt completely satisfied after finishing The Death Cure, but The Kill Order is like dessert. James reveals even more pieces of this wonderful puzzle of a story, connects them with pieces from the other books in the trilogy, and turns everything you thought you knew on its head. The story shows us what happened after the sun flares struck the earth, how people coped in the aftermath, where the Flare virus came from and how it spread. It’s told through the eyes of completely new characters, Mark and Trina, and we follow their fight for survival after the sun flares strike the earth. The things that Mark and Trina see are terrifying, horrific and sometimes incredibly creepy. Several times I thought twice about reading it before bed, in case those images stayed in my head. Although they’re different characters, you feel for them just as you felt for Thomas, Teresa and their friends. If you want a series that blows The Hunger Games out of the water, read The Maze Runner Series. N.B. This is the US hardback edition of The Kill Order. The paperback edition, published by Chicken House, will be available in NZ in March 2013. I’m an impatient reader, especially when it comes to series, so I couldn’t wait. Metawars – whose side are you on? In an unforgiving future, two warring factions – the MILLENNIALS and the GUARDIANS – are locked in a brutal battle over control of an online virtual world called the Metasphere. Jonah Delacroix has always known which side he’s on – the same side as his dead father. But when he assumes his father’s avatar, he learns that things aren’t as black and white as he once believed. He’s catapulted into a full-throttle race through both worlds – but can he find the truth? Metawars is a great new futuristic Young Adult novel by Jeff Norton. It’s a very cool, action-packed story, kind of like Alex Rider meets The Matrix. Metawars is out now in NZ from Hachette NZ. Check out these great videos from the two factions of the story. Today I’m joined by Ambelin Kwaymullina, author of the fantastic new futuristic Young Adult series, The Tribe. The first book in the series, The Interrogation of Ashala Wolf was released last month and if you haven’t heard all the hype about it you can read my review here on the blog. I caught up with Ambelin to ask her a few questions about her hot new series. What 5 words would you use to describe The Interrogation of Ashala Wolf? Mysterious. Dramatic. Thrilling. Smart. Hopeful. Mostly, it was Ashala herself. She is such a strong character, that it would have been impossible for me not to tell her story. From the beginning, the first line of the book has always been the same – ‘He was taking me to the machine.’ Those words followed me around for a few days before I began writing, lurking in my consciousness and demanding that I write more. Then, once I started writing, I had to keep going until I reached the end – I certainly couldn’t leave Ashala trapped in the detention centre! The Tribe has a spiritual connection to the land and the creatures that inhabit it which, I think, makes your story unique. Is this aspect of the story from your own culture? Yes, it is. Aboriginal people, and Indigenous people from all over the world, have strong connections to our homelands and the ancient spirits of our peoples. Ashala’s world is very different to the one we live in now, of course – the tectonic plates have shifted, creating a single continent, and people no longer make divisions on the basis of race. But Ashala’s ancestors were Aboriginal, so I knew she’d have a deep love for the forest that she lives in. And I knew that her connection to country would be a source of strength and courage for her, the same as it is for Indigenous peoples now. Do you know how the Tribe’s story will end or will you wait to see how the story evolves? No, I know how it ends. Many of the small details are mysterious to me, but I know where all of the Tribe will be, at the end of the story. And, for this particular story, I think that’s important. I don’t think I could tell it the way that it deserves to be told otherwise. Will we find out more about the abilities of the Tribe and where these came from? Oh yes. I didn’t have a lot of narrative space to explore this in the first book, but as the series goes on, readers will find out much more about how all the different abilities function, and what their strengths and limitations are. There’s some tough times coming for the Tribe, too – so they’re all going to have to push themselves, and be able to control their abilities a lot better than most of them can now. How did you find the experience of writing a novel, compared to creating a picture book? Harder! Much, much harder…also, with picture books, I’d gotten used to being able to pore over every single word until I was satisfied the text was completely perfect. It takes much longer to do that with a novel, which was something I hadn’t realised until I was hopelessly overdue on a deadline. I think, though, that writing picture books, where you have to tell a complete story in not a lot of text, did teach me to be more disciplined with words than I would have been otherwise. That was helpful. On the other hand, I am going to have to learn to restrain my perfectionist tendencies, or I’ll never get the second book done. What books would you recommend to anyone who enjoyed The Interrogation of Ashala Wolf? There’s so much great dystopian fiction, and sci fi/fantasy fiction, for young adults – here’s some I’ve particularly enjoyed: Suzanne Collins’ The Hunger Games series, Isobelle Carmody’s Obernewtyn series, Veronica Roth’s Divergent series, and Moira Young’s Dustlands series. The next stop on Ambelin’s blog tour is with Celine at http://forget8me8not.blogspot.com.au/. The Kill Order is James Dashner’s prequel to one of my favourite series, The Maze Runner. It’s due out on August 14 (probably slightly later in NZ) and I’ve got my copy ordered. The Maze Runner, the first book in the series, is in my top 10 favourite books and I think it’s even better than Hunger Games. James Dashner is also the series architect of the new multi-layered series from Scholastic, The Infinity Ring, which is due out worldwide on August 28. If you’re a fan of the 39 Clues series you’ll love The Infinity Ring.